I am a soil scientist. My undergraduates was in soil survey and tropical agriculture and I hold a MSc in soil science and plant nutrition from Wageningen University and a PhD from Reading University. In August 2011 I'll start working as a professor of soil science at the Department of Soil Science, University of Wisconsin - Madison, USA. Since January 2011, I am the IUSS Secretary General. I was the IUSS Deputy Secretary General from 2002 to 2010, and amongst others I was responsible for the IUSS website, IUSS Alerts and Bulletin. The website has over 140,000 visits per year. I am a joint editor-in-Chief of Geoderma, editor of the World Soils Book Series and Progress in Soil Science - both published by Springer. 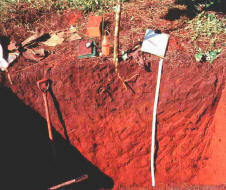 Prior to my current position, I was senior soil scientist at ISRIC - World Soil Information in Wageningen, Netherlands (1999-2011) and lecturer in soil science at the University of Technology in Papua New Guinea (1995-1998) and worked several years as soil surveyor and soil fertility specialist in Tanzania, Congo (Zaire), Indonesia, Australia and for the World Agroforestry Centre (ICRAF) in Kenya.